MANILA, April 27 (PNA) -- President Rodrigo Duterte on Thursday welcomed Brunei Sultan Hassanal Bolkiah Mu’izzadin Waddaulah in Malacañang for a bilateral meeting ahead of the 30th Association of Southeast Asian Nations (ASEAN) Summit and Related Meetings. The Palace said that the bilateral meeting between President Duterte and Bolkiah will be an opportunity for the two Leaders to build on the discussions and agreements made during the President’s state Visit to Brunei in October 2016. Presidential Spokesperson Ernesto Abella said that included among the agenda for discussion during the meeting are boosting defense cooperation with focus on countering terrorism, violent extremism and piracy at sea; and sustaining the common campaign against illegal drugs in the region. 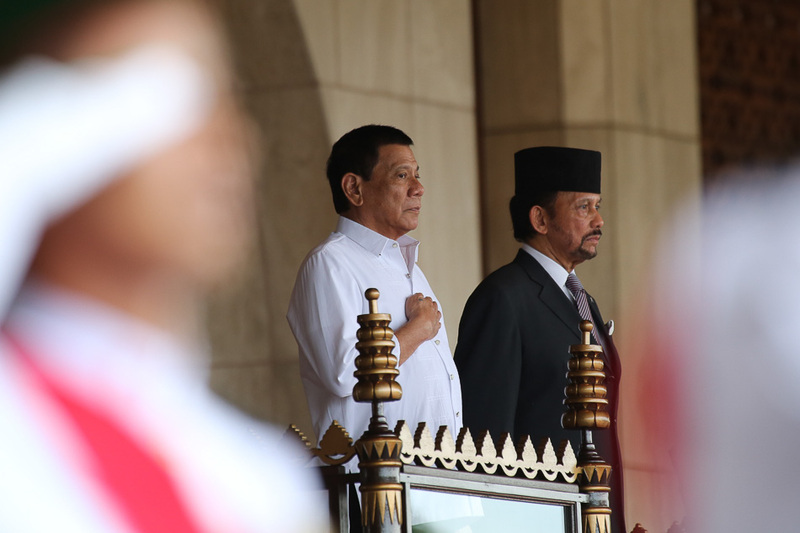 The Palace official said President Duterte would also highlight the importance of Brunei’s continuing support for the Mindanao Peace Process and Mindanao’s development as well as Brunei’s active participation and strong support for the Philippines’ ASEAN Chairmanship in 2017. Expanding economic ties and exploring new trading areas -- such as in agribusiness and food processing including halal -- and infrastructure would also be discussed. Meanwhile, Duterte and Bolkiah are also set to sign agreements on Cultural Cooperation and on Halal Industry and Halal Products Development. The memorandum of Agreement (MOU) on Cultural Cooperation is aimed at promoting or enhancing the knowledge and understanding of visual, musical and performing arts, literature and cultural activities. On the other hand, the MOU on Halal Industry and Halal Products Development would provide the framework for bilateral cooperation to mutually develop each other's Halal industry and products and services by way of exchange of investment, products, technology and best practices. After the bilateral meeting, the two leaders are will meet the press for a joint statement.